Sen. Jack Tate at the Capitol on Feb. 10, 2017. 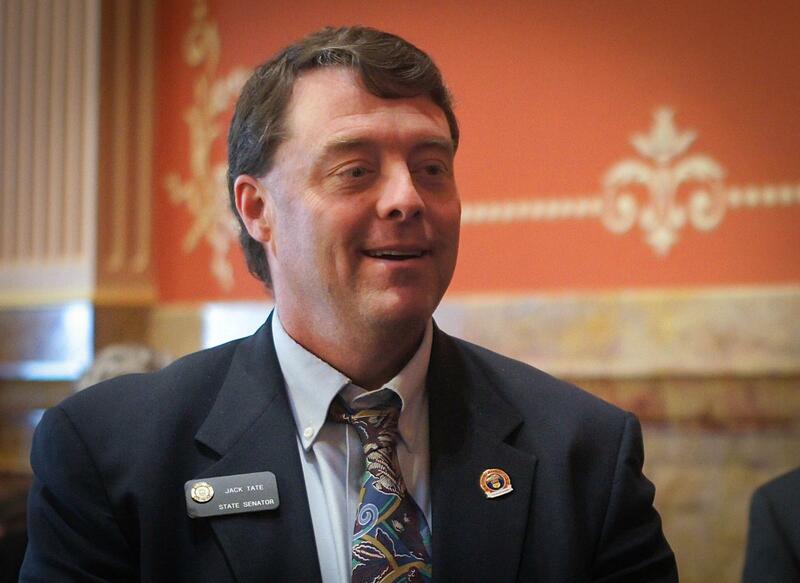 Another woman has decided to file a formal complaint alleging sexual harassment by a lawmaker at Colorado’s Capitol. The former legislative intern alleges that Sen. Jack Tate regularly leered at her and nudged her, making inappropriate comments during the 2017 legislative session. That raises the number of formal complaints against lawmakers to four. Earlier this month, we reported that Rep. Faith Winter and former lobbyist Holly Tarry filed complaints against Rep. Steve Lebsock, a Democrat, alleging unwanted sexual advances and vulgar and inappropriate discussions. 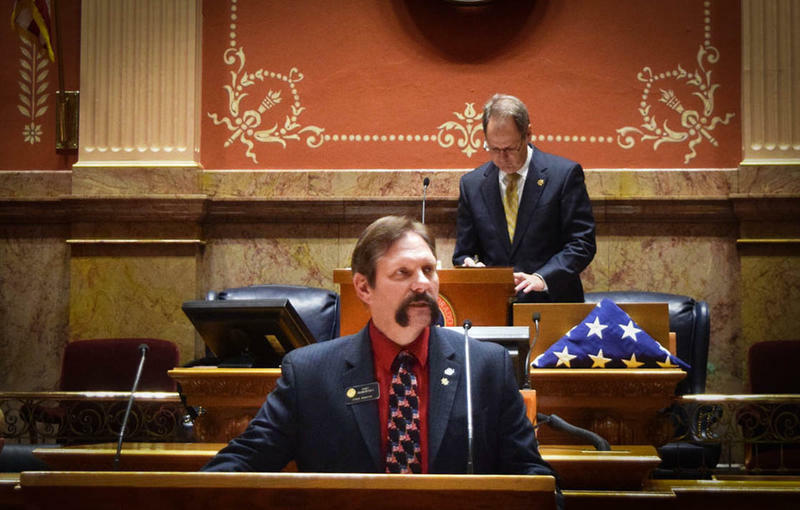 On Nov. 26, a former legislative aide filed a complaint against Sen. Randy Baumgardner, a Republican, alleging that he slapped and grabbed her buttocks about four times throughout the 2016 legislative session inside the Capitol building during the work day. Bente Birkeland reports on a formal complaint of sexual harassment filed against Senator Jake Tate. In the fourth complaint filed on Nov. 29 with both the Senate and House, a former intern makes allegations against Tate, a Republican. She was 18-years-old during the legislative session when she alleges he harassed her. Under House and Senate rules the complaint process is confidential, but we received a copy of the complaint from the former intern, who wishes to remain anonymous. She said she fears retribution and may still pursue a career in politics. According to the complaint the harassment began when Tate commented on her skirt in an elevator inside the Capitol on her first day. The complaint said she eventually avoided going to the Capitol building from her office across the street and noted the harassment when she quit her internship. "Dear Bente: I take this issue very seriously and am glad that a process is being put in place to clarify this situation. Respectfully, Jack." According to the complaint process, Tate will learn his accuser’s name. He is not bound to keep that information confidential. The intern first voiced her allegations in a Nov. 16 story by us saying that he repeatedly made her uncomfortable. Our story led to other media outlets reporting on Tate and many comments online -- some supportive of Tate. The intern told us comments that seemed to downplay her experiences and debate if she was a victim of sexual harassment led her to file the formal complaint. 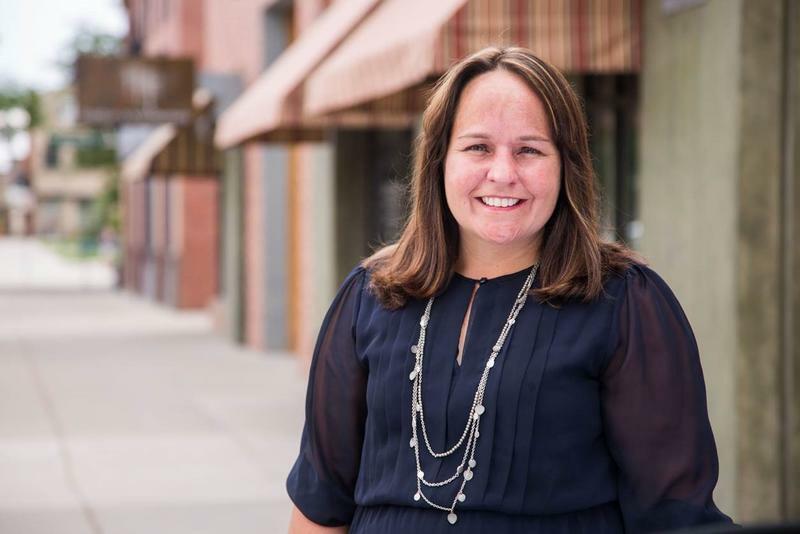 She also singled out comments by seven women, including prominent female lobbyists and a Democratic state representative publicly backing Sen. Tate. “If people need a report to make it real in their minds that this happened to me, that’s messed up, but I’ll do it,” the intern said. The intern’s supervisor, Sophia Laster, Rep. Michaelson Jenet and a fellow intern, Ellie D’Anna, each corroborated that they heard the intern’s concerns about Tate. D’Anna claimed to witness Tate’s interest in the intern and some of his comments about the clothing she wore. The General Assembly’s workplace harassment policy highlights innuendos about one’s clothing as an example of verbal harassment. VERBAL: I. Sexual comments or innuendos about one’s clothing, body or sexual activity. In response to the earlier allegations Tate said it is an honor to serve the state and he has the utmost respect for the men and women he works with. He said he was unaware of any instance in which he made an individual feel uncomfortable. “I have been at the Capitol for three years and during this time no person has expressed to me or my colleagues that I caused discomfort or created distress,” said Tate. Since the original story broke, seven women have come forward in the media to praise Tate’s professionalism. Longtime lobbyist Micki Hackenberger commented to Channel 7. She said she was asked about her personal professional experience working with Tate who serves as the chair of the Senate Business Labor and Technology Committee. She said she found him professional. In a subsequent Facebook post, she said her personal experiences don’t amount to denying the experiences of someone who alleges harassment. “If someone says they feel uncomfortable there is no reason not to believe they felt that way,” said Hackenberger. In an article from the Colorado Springs Gazette's political publication Colorado Politics, six women stated that they have not observed any inappropriate behavior while working with him. Democratic Rep. Jeni Arndt said maybe Tate didn’t understand the perceived power relationship between him and the intern but she doesn’t think it was intentional. Lobbyist Cindy Sovine said Tate is very respectful of his wife and daughter and the women around him. Some of the women told us they wanted to clarify or expand on their comments. Dubray said her purpose was to highlight the distinctions between the ranges of different allegations. “I just didn’t want the intern to feel like I was speaking for her experience,” she said. “‘It didn’t happened to me so it didn’t happen to you.'" Sovine said she wants to help young aides and interns feel empowered in any situation to not be victims. She said what might be acceptable to one person may not be to someone else. Jensen lobbies for sexual assault victims and victims of domestic violence. She said younger women, interns, and aides who are beginning their careers are especially vulnerable because they are less likely to be believed. The General Assembly’s policies, definitions and processes are under review. Legislative leaders from both parties and both chambers are meeting to reevaluate the workplace harassment policy on Dec. 15. The meeting will take place at the Capitol at 10 a.m. and is open to the public. Westminster Rep. Faith Winter and other women who’ve worked at Colorado’s capitol have their #MeToo moments. That movement began in early October when allegations of sexual misconduct against Hollywood filmmaker Harvey Weinstein resulted in women coming forward with their stories about harassment by powerful men in a variety of workplaces, including NPR. Winter and others came forward publicly to KUNC this month, alleging at least three male lawmakers had engaged in sexual harassment.